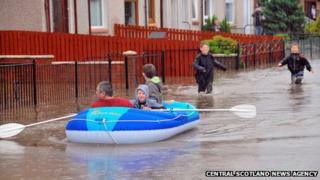 Sandbags were distributed by Stirling and Clackmannanshire Councils after heavy rain in central Scotland. 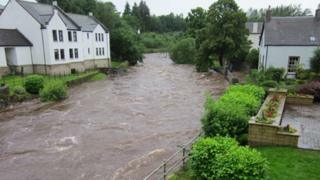 A number of roads in the area were closed as a result of flooding and two nursery schools were closed in Stirling. 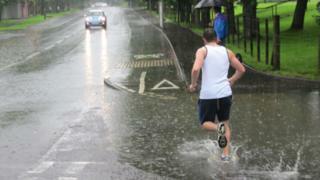 The Fife area was also badly affected by heavy rain. And some train services have been disrupted after the Glasgow Queen Street to Oban service hit a landslip, as did the Rosyth to Dunfermline train. No-one was injured in either of the two incidents. Flooding caused problems for householders in Fife this evening, with firefighters using an inflatable boat to rescue five people from a house at Shiresmill, near the village of Blairhall. Fife Fire and Rescue said they also received calls after bad flooding at Cairneyhill near Highvalleyfield. In South Queensferry, fifteen houses in the Springfield area were affected by flood water in the street. But BBC Scotland's weather service said the rain was expected to dissipate overnight into Thursday.